Gently remove residue and odor with all-natural pads infused with witch hazel and colloidal silver. Your dog’s ears cleaned and deodorized while calendula, comfrey, and mullein flower soothe delicate tissue. Pure lavender essential oil leaves the area smelling refreshed and healthy. $14.00 for 50 pads in resealable jar that prevents drying. This all-natural serum helps to eliminate smelly, itchy, infected ears, especially if your dog is prone to ear infections. The antibacterial/antimicrobrial formula eliminates smelly ears while breaking down wax buildup. 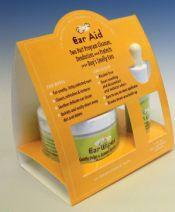 Ear Clear contains arnica and chaparral oils to decrease pain and discomfort caused by swelling. It also contains organic comfrey and calendula to help soothe, heal and prevent. Did you know that ear infections are the number one reason why dog owners go to the vet? Sometimes it takes multiple visits to eliminate the problem, which is not only expensive but also frustrating for both dog and owner. A preventive home regimen is the best way to keep a dog’s ears clean, healthy, and infection-free. This gives you—the dog’s owner—frequent opportunities to monitor the ears and ensure that problem conditions are never allowed to develop. A perfect time to start the regimen is when you have your dog groomed. Happytails Ear Wipes is an easy way to clean your dog’s delicate ears. The pre-moistened pads contain colloidal silver, an all-natural ingredient that suppresses bacteria, and witch hazel, which has been used for generations to safely cleanse and sanitize. Our botanical blend gets rid of dirt, wax and debris while reducing unpleasant odors. INSTRUCTIONS: Hold your dog’s face firmly with one hand. With the other hand, use Ear Wipes around and inside the ear. Get in all crevices, but do not insert into the ear canal. To help prevent spread of infection, use a new Ear Wipe on the other ear. Do daily for two weeks and reduce to every other day, then gradually to every third day. Happytails Ear Clear is an antibacterial/antimicrobial formula that contains no pharmaceuticals or chemicals. Wax buildup that can often be a breeding ground for infections is broken down. Ear Clear contains arnica and chaparral oils to decrease the pain and discomfort caused by swelling. It also contains organic comfrey and calendula, which soothes, heals and protects. A touch of essential oil of lavender removes unpleasant odors thus completing an ideal solution for ear health. INSTRUCTIONS: After cleaning your dog’s ears with Ear Wipes (part one, above), apply 3-5 drops of Ear Clear into each ear canal. Closed the dog’s ear flap and massage gently. Repeat two times per day for two weeks. If your dog is prone to ear infections, apply twice weekly as a preventative. © Dog Day Afternoon Spa, Inc. All Rights Reserved.